Today’s visiting author is Bev Irwin, who also writes as Kendra James. Starting. I love starting new projects. I don’t base my characters on real people but of course all the people of have met in my life and all the experiences I have had contribute to giving a base to draw from. Sometimes a character talks to me and wants me to tell her story. As she talks to me, I learn more about her especially when she reveals her inner heart and soul and what she needs me to help her with. Other times a situation comes to me and as I think about it the character who needs to tell the story, come to me. It’s called avoidance. Checking emails, getting something to eat, checking emails, opening up my document, checking to see if another email came in, stretch, check for real mail in the mailbox, check for emails again (I should restrict myself but it is so tempting to keep checking, especially when you hear that little alert that lets you know there is new mail. Then I make myself sit down and write, regretting all the time I wasted. I’m not a big plotter but I am trying to do more of this. Usually I know the beginning, several scenes, and have a rough idea of how the book will end. On research, it depends what type of writing I am doing. If the writing is a life story, either romance or mystery, there’s not a lot of research needed. With my medical pieces, I’ve been a registered nurse for many years and working in a lot of specialty areas so often it just comes from my experience. Depending on the topic, I may have to do some research. I’ve written a middle age/youth novel, IN HIS FATHER’S FOOTSTEPS. Now for that book, I did have to do a lot of research on surviving in the north. Things like how to make a bow and arrows, moccasins, a fishing net, snowshoes, and finally a travois. Also what food would be available in the fall. I gathered a lot of information, but hopefully I will write another book where I can use it again. Oh, I jump around. I wish I could write from the beginning to the end but alas, I don’t seem to be able to do that. I write bits and pieces here and there, on scraps of paper or little notebooks that I carry with me. On the computer, I use Scrivener for mac. It is great. I can make a new scene and write only the title or thousands of words and if I need to I can just move the scenes around. Telling people about it and showing them the covers. I’ve been lucky. The first cover for my romance, WHEN HEARTS COLLIDE, I filled out a form and pasted descriptions of my hero and heroine from the book. Voila, I got it back and loved it. For GHOSTLY JUSTICE, and MISSING CLAYTON, the cover artist at Black Opal Books found some images, sent them to me and we worked on things like position of the title and my name. As I said, I’ve been lucky and love all my covers especially MISSING CLAYTON. Oh, that is a hard question. I have so many characters that I have written about and they all have a special place in my heart. I love Daria from GHOSTLY JUSTICE coming out April 14th. She is spunky, clever, and reluctantly courageous. She has to deal with a needy mother and her overattentive boyfriend while being harassed by a ghost. And talking about that ghost, she was a lot of fun to write. Amanda has a sense of humour, is stubborn, and wants revenge. But being trapped in the house and never being able to contact anyone, Amanda has her own troubles. Then in MISSING CLAYTON, how could I not loose my heart to Jenny, a single mother who son is missing. I was with her every minute as she dealt with her own guilt, the police and the media’s speculation. Then as days passed and still Clayton is not found, I cried with her. Clayton, a six-year old child, kidnapped from his backyard, now alone and afraid, not even his favorite stuffed bear to hug. My heart was agin lost. How can I choose? That is like asking a mother which of her children she loved most. Award-winning author, Bev Irwin, lives in London, Ontario, with three assorted cats. One that hid in her car when she moved from the farm and two others dropped off by her daughter on two different occasions. Her three children have flown the coup, but her granddaughter, Jasmine, is a frequent visitor. As a registered nurse, she likes to add a touch of medical to her romance and mystery novels. She writes YA, children’s, and poetry. She prefers spending time in her garden, writing, and reading to being in the kitchen. 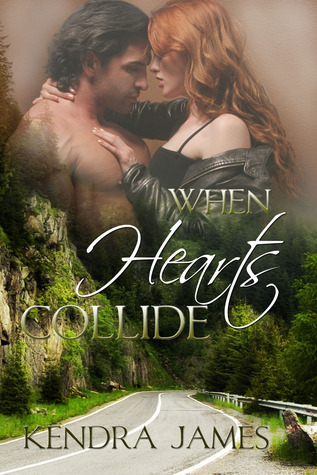 Her debut novel, WHEN HEARTS COLLIDE, a contemporary romance, came out in December of 2011 with Soul Mate Publishing under the pen name of Kendra James. Her YA paranormal, GHOSTLY JUSTICE, will be released by Black Opal Books on April 14th, 2012. MISSING CLAYTON, a suspense novel, will also be published with Black Opal Books later this year. Great interview Bev! Love your covers. Thanks, Leslie. Jack did a great job. Great interview, Bev. You are opposite of me. I find starting the book the hardest, you have to hook the reader so he/she can't put the book down till it's finished. It is also something I'm looking for in the book when I read it. Tying it all nicely at the final chapter and putting that THE END is the easiest for me, but sad. Though should be the happiest. It means the book is done, but somehow I don't like to end it. Maybe I'm strange. Who knows? Looking forward to reading your stuff. Thank you. But do you have to end it? Maybe there can be a sequel? Great interview. I loved When Hearts Collide. Wishing you nothing but success in your career. Thanks Janna. I'm glad you enjoyed When Hearts Collide. I appreciate your good wishes. Good luck with your releases. Both covers are wonderful. Thanks, Debbie. Glad you could join me here today. Thank you, Sarah. It was fun spending time with you today.